If flying, landing in Grand Junction is a consideration. It’s about at 110 mile 2 ¼ to Moab via scenic route 128. Along the way you can stop at Fisher Towers – site of several John Wayne/John Ford movies. Drive by photo-ops or take a short hike. About an hour outside of Moab is Dead Horse Pt State Park. It has a drive to a dramatic overlook of the Colorado River Vista where the river does a 180 hairpin turn. Best shooting time is just be before sunrise or late in the day. Definitely take some wide angle shots. Park Avenue, Courthouse Towers, Petrified Dunes, Balanced Rock, Garden of Eden, The Windows, Turret Arch, and Fiery Furnace, among others. Since shooting near the car, take any equipment you wish. Generally, better shooting times are early or late in the day or with nice blue skies with good clouds. 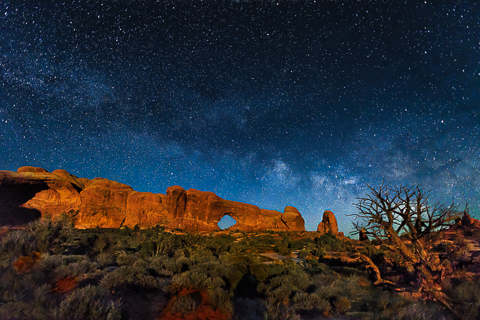 You see a number of arches that are not otherwise accessible including Landscape Arch (longest in world), Partition Arch, Navajo Arch, Double O Arch, and of course, the Dark Angel monolith. You can walk over a series of fins which is cool.The trail is sandy, rocky in places, and can be hot. Take water and snacks. There is not a lot of elevation change for the 7 1/2 mile hike. The trail begins at the end of the park road at the Devils Garden Trail Head. General settings with a wide fast prime lens like a 20 or 24mm F1.8. ISO about 2500. Exposure about 1/25 or 1/20 to stars streaking. Tripod is a must. If no moonlight, consider light painting. Need a head lamp or flash light. Small tripod helpful, be ready because light changes quickly. Could boost the ISO and shot hand held as an alternative. The 1 1/2 mile trail (one way) begins at Wolf Ranch just about 1 mile drive off the main park rd. Begin the walk about 1 ½ to 2 hrs before sunset. Absolutely have a wide beam flash light for the walk back. Awesome sunrise shot. The underside of the arch can look ablaze as it captures morning light reflecting off of the 500ft nearly vertical cliff face below. The view through the arch into Bucks Canyon is awesome. Good idea to scope out the roughly ½ mile walk from the parking area in daylight in advance of the shoot. Plan to arrive at least ½ hour before first dawn light since the shooting area can be crowed. This means you will park when it’s dark and walk the trail in the dark. A wide angle lens and tripod are a must. 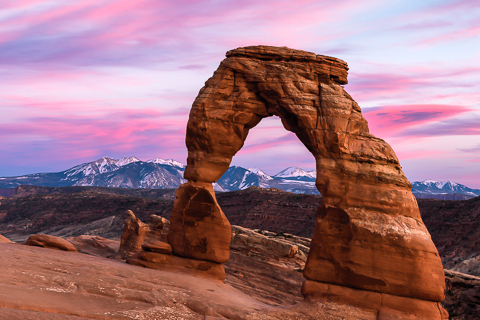 From Moab it’s about a 50 minute (40 mi) drive via 191 N, 313 W, and Grand View Point Rd. Continue east on the park road to the Green River Overlook. Laurents suggests this as an afternoon shot. I don’t see why you can’t combine this with your scouting for the Mesa Arch shot. Further east on the park road to the Upheaval Dome trail head. The trail is relatively short with two viewpoints. 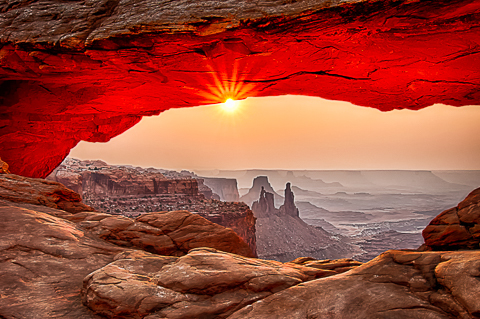 You can take these in after the Mesa Arch sunrise. Starting at Elephant Hill you can do a ½ day (5 mile) or full day (11 mile) hike through and along the spires. Again take water, snacks, and consider a 24-70 or 24-120 zoom to keep the backpack reasonable. All photos are copyright Bill Naiman. Please respect his copyright!